For my focal point image I used Silhouette Rhinestone Anchor cutting file which I then set to work filling with some value rhinestones. I love how sparkly it looks in person. For my background I layered chevron stripes cut from cardstock using Papertrey Ink's Chevron Stripes Border Die. When I think of Nautical clothing, I think of white stitching on bold colors so I added a bit of that with some large eyelets to complete the look. My sentiment was heat embossed using Papertrey Ink's Think Big Favorites Mini Stamp Set. This birthday card is awesome! 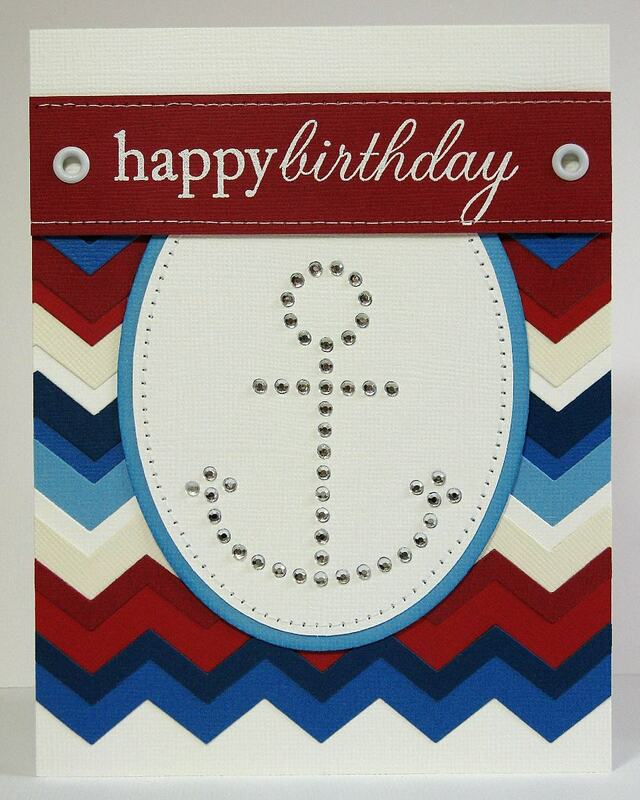 I love the chevron background and in those big bold blue and red colors... definitely nautical colors... the rhinestone anchor adds a bit of pop and sparkle! TFS my friend and I hope you are having a great weekend!